The following comes from a Jan. 4 story on the website of Orange County Catholic. 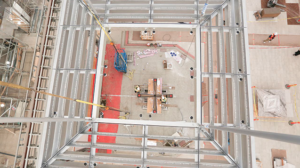 Construction crews recently put in place two centerpieces of Christ Cathedral – the Crux Gemmata and stone altar. Crafted in Omaha, Nebraska from blackened steel and transported to Orange County in four separate pieces, the Crux Gemmata weighs 1,000 pounds, rises 18 feet above the cathedral’s altar and hangs from the baldachin. The Crux Gemmata is a cross typical of early medieval art, affixed with gems and the corpus of Christ. The raising of the Crux Gemmata signals a symbolic milestone as Christ Cathedral transforms into a Catholic house of worship…. The stone altar was then put in place under the Crux Gemmata, which was gifted by the Jilot Family. The altar was gifted by the priests of the Diocese of Orange, who collectively donated nearly $900,000…. The historic project to renovate Christ Cathedral remains on schedule and on budget. The cathedral will be dedicated in July 2019. Wow, imagine the statement this makes from aircraft. At night, it could be lit in such a way to make the cross visible even from space. What a witness to the faith! Is there an opaque roof over the sanctuary? Sad that the Cross is presented for all the world to see? I’m sure that the cross is folly to some, maybe to you too. A stumblng block and a scandal, to be sure. Save us savior of the world, for by your cross and resurrection you have saved the world, . Will this church have provisions for the Latin Mass? Seeing as how there will be provisions for ethnic Mass in Spanish, Vietnamese, Tagalog, Korean and who knows what else… Latin — the Church’s universal language, should be included whether Novus Ordo or TLM. Thank you! No it does NOT. DMR,, It has an altar, yes! Altar for $900k from the priests of the Diocese? Men who often work for little more than room and board. How many are needy in the OC? What is the greater glory of God? I believe one of the priests in the diocese is an heir to the Carl Karcher fortune… the founder of Carl’s Jr. burger joints. I bet he kicked in quite a lot all by himself. It’s best that we (I include myself in this…) worry about our own actions, and not criticize our beleaguered priests, especially when they are helping to provide the very altar for Our Lord to be present for all… poor and rich alike. I for one am grateful for their generosity. St Christopher: the conversion process of our Catholic faith will enable the transformation of this formerly Protestant church into a holy and sacred Catholic Cathedral. Have a little faith and see the glass as half full instead of half empty. A glass half full of something distasteful is still distasteful, whether you see it as half full or half empty. Yes…the distastefulness is undoubtedly due to the pollution in the Church which stated long before Vatican II. The recent reports of abuse reveal that the horrors of abuse started long before the Council. The design and reconstruction of the glass Christ Cathedral is symbolic of the transparency so much needed in the Church today. As the Church building is transformed, let us pray for the transformation of all those with hardened hearts. I respect the priests’ collective generosity. My beef was why spend all of this large sum on an Altar. Perhaps one can get a nice Altar from a parish which is closing elsewhere. Even with shipping and other costs, maybe a lot of money still left for the needs of the poor. Mike M, we all know this isn’t your first rodeo. You know that when a church is renovated or built anew, that the price attached to each item in the building is irrelevant to the actual price of the item. The altar may have only cost $10,000 to build, transport and install, but if you want “naming rights” it will cost a lot more. Look at the name of donors of most stained glass windows in older churches as an example. I wonder how much the Stations of the Cross will be, each? IOW, funding has little to do with costs. But, you knew that.